close-up of the chocolate icing before the banner went on. It was awesome! Everything about it was delicious! Melody thought it was great. 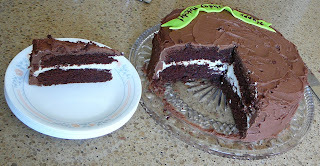 I loved the orange flavor in the filling and the new chocolate cake recipe was lighter than my old recipe. When I make this recipe again, I will put some of the chocolate chips deeper into the batter. I really liked the contrast of the white filling against the brown cake. Very nice. It was a simple cake to decorate, since Melody wanted "just chocolate icing". I just spread it on roughly and poked in the fondant flowers I made a while ago and added a fondant banner that I piped with piping gel. I liked this cake. It had more cocoa than my other cake and tasted more chocolate-y. I certainly recommend it! Enjoy!